Way of Life has always stayed on the cutting edge of technology for the furtherance of the preaching of God’s Word. I purchased the first portable computer (the Osborne, 1981). We had one of the first Independent Baptist web sites and published one of the first hypertext editions of a Bible encyclopedia. O Timothy magazine was typeset electronically on a computer from near its inception in 1984. We had one of the first electronic lists for the publication of daily articles. We were among the first to publish a weekly news report and a monthly magazine in electronic edition. Early in 2011, we put almost all of our books into the major eBook formats (KINDLE, PDF, ePUB), including the Way of Life Encyclopedia, and made them available as downloads from our online catalog. We are also publishing an extensive list of free eBooks, which are available at the Way of Life web site. We publish the Fundamental Baptist Digital Library, which consists of 4,465 select books and articles comprising 2.5 gigabytes of information. It is the largest fundamentalist research database available, consisting of a contemporary church issues research library, a preacher’s information database, a Baptist history library, a Bible Version library, a library of dispensational Bible commentaries, and much more. Every book and article is in eBook (PDF) format which can be read by electronic Readers as well as desktop and laptop computers. We also publish the Way of Life Advanced Bible Studies Series in digital format. There are currently 20 volumes averaging 265 pages each (totaling 5,500 pages of Bible study material). The subjects are Acts, Bible History and Geography, The Bible Version Issue, Defense of the Faith, First Corinthians, The Four Gospels, Genesis, Give Attendance to Doctrine, Hebrews, A History of the Churches from a Baptist Perspective, How to Study the Bible, James, Job, The New Testament Church, Pastoral Epistles, Proverbs, Psalms, Revelation, Romans, and Understanding Bible Prophecy. The eBook is an exploding technological trend. Early in 2011, for the first time an eBook was a bestseller on Amazon. On January 28, 2012, Amazon reported that Kindle eBooks sales had surpassed those of both hardback and paperback books. That is a major milestone. In June 2011, Barnes & Noble reported that it sold three times as many digital books through its website as print books. eBooks accounted for 20% of books sold in the U.S. in 2011. In January 2012, more than 40 eBooks outsold the print editions. eBook readers have been out for several years, but they didn’t catch on until Amazon produced the Kindle in late 2007. The sale of eBooks was almost flat before that, but by 2008 sales increased to $100 million, and in 2012 that number was $1.3 billion. A report in USA Today for February 25, 2011, said that public libraries across the United States are seeing a surge in demand for electronic books. 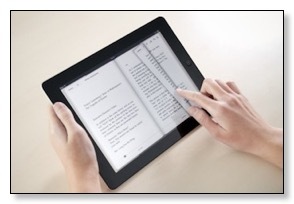 An electronic book supplier reported a 200% increase in eBook circulation in 2010. In 2013 the first bookless public library in America opened in Bexar County, Texas. The $2.3 million library’s book collection is entirely digital. It features rows of iMacs and iPads for in-house browsing and hundreds of tablets for checkout. Bexar County’s BiblioTech library is the future, and it has a steady stream of visitors from other states and from as far away as Hong Kong to learn from the experiment. The hugely popular Apple iPad, which was released in April 2010 and had sold 121 million units by the first quarter of 2013, has provided a further massive surge in the popularity of eBooks. In fact, it singlehandedly created the tablet computing frenzy (earlier Windows tablets were never popular). In addition to being an all purpose tablet computer, the iPad is an excellent eBook reader with a wide variety of reader applications available for every format of eBook. I have owned a Sony Reader, a regular and a color Kindle, a regular iPad and a mini iPad and these have changed the way I read books. I read and review probably 100 books a year, often more, and collected a personal library of over 6,000 volumes. I love a printed book as much as anyone, but eBooks are also a great way to go. When I travel or just stop somewhere for a cup of coffee or whatever, I can carry an assortment of books, including a serious Bible study library, instead of the one or two books I was limited to in the past because of the weight and size constraints of paper books. It is my habit to underline and annotate books as I read, and I can do all of that and more with eBooks. Further, you can change the size of the font to make it as large you please, which is an important thing if you have trouble reading the small type in regular books. This is not to say that eBooks and eReaders are mature. They are still in a rudimentary stage, but that is changing quickly. Annotation mechanisms vary greatly between apps and are rapidly improving in all formats (pdf, mobi, ePub). The portability of eBook files across platforms is clumsy at present. But the technology will mature quickly now that the concept of eBook reading has taken off. This is not to say that eBooks have every advantage over print books. Typically, you don’t own an eBook the same way you own a print book. It is more like you license the use of the book, particularly when purchasing from Amazon or one of the other big eBook merchants. You don’t have as much liberty to give the eBook away or even loan it as you are with a print book. Then again, the problem with eBooks, from the author’s and publisher’s standpoint, is that it is easy to make copies of them and distribute them to people who haven’t paid. The purchaser of a print book can’t do that. If he gives it away, he no longer has a copy himself. But with eBooks it is possible to make multitudes of duplicate copies at basically no cost and even to distribute them widely via the Internet. This is why big book merchandisers such as Amazon add copy protection and try to lock the use of the book within a tightly controlled system, such as the Kindle format. We are only on the cusp of the eBook revolution, but the change is coming quickly. For example, in 2010 I read and reviewed probably 100 books on evolution and archaeology for a new apologetics course. Only about 10% of those books were available in eBook format. For now, only books that are old and out of copyright and books that were published in the last couple of years are typically available in electronic format. But this situation will doubtless change dramatically in the next few years. Google, for example, having settled lawsuits pertaining to the scanning and online distribution of copyrighted books, is entering the eBook market in a massive way, and this has the potential to promote eBooks far beyond what Kindle and iPad have done so far. Further, every publisher will, as a matter of course, soon be offering all titles in electronic format. Most already are. If a reader is considering purchasing an eBook reader, we recommend either the Kindle or the iPad, but the iPad is far superior in our estimation. I have owned both the Kindle (including the Kindle Fire) and the iPad, and in my estimation you can’t go wrong with the iPad. Not only can you read books, but you can listen to audio sermons and music, read e-mail, browse the web, watch videos (such as our powerful eVideo series), study the Bible, record thoughts and sermons, and a thousand other things. I moved to the iPad mini when it came out in 2012, and it is a fantastic device and super portable. With the iPad, you can read PDF files on a wide variety of apps. You can read ePUB files via BlueFire, Marvin, iBooks, and many other apps. And you can read Kindle books via the Kindle iPad app. In fact, the Kindle app and the OliveTree Bible study app are my most used apps in the iPad. I do all of my preaching and teaching from the iPad. Instead of having to print out a new edition of a sermon or series each time I make changes, I simply import the files to the iPad, and they’re ready to go. In some cases I use DropBox and the new edition of the file is automatically distributed to all of my eDevices. We only have experience with the iPhone and iPad, so we cannot give recommendations about apps for other devices. First, there is GOOD READER. It has excellent options for annotating, including notes, highlights, underling, and drawing. It even allows you to modify the PDF or create a separate annotated edition of it. You can also copy and paste text into other programs. Second, there is iANNOTATE. It has extensive annotating capabilities plus a wealth of other features. I use the BLUEFIRE app for pdf files I preach from, because the only thing I want to do in that situation is turn the pages, and while doing this with a more basic eReader like Bluefire (in contrast to a more full-featured annotation reader) there is less chance of bringing up an unwanted feature such as highlighting. I use the KINDLE app for the iPad frequently because I like the convenience of using the Amazon store for eBook purchases. And the Kindle app has evolved into an excellent PDF reader. Also, you can e-mail any sermon or article or book in Word doc or PDF format to your Kindle account and it will be converted and delivered to your Kindle device or Kindle app. The Kindle reader is basic but effective. You can highlight and add notes, and the app remembers where you stopped reading. This could be a good solution for pastors who want to upload their sermons to an eReader. You or your secretary or someone else can upload articles, sermons, even books, to your iPad (with the Kindle app installed) or Kindle device. All of the relevant information about this process can be found on the Amazon site. Go to your Amazon account under the section on “Manage Your Kindle.” Toward the top of the screen there is a “View” window that lets you choose Books, Magazines, Blogs, Personal Documents, etc. The documents you e-mail for conversion and download can be found under the Personal Documents section. Each file is listed and you have the option to delete it or deliver it to your Kindle device or app. You can also send your file (book) to your Kindle account using Amazons free “Send to Kindle” app. A pastor recently asked how he can load the PDF files from the Advanced Bible Studies Digital Library to his Kindle, and I advised him use the e-mail method. PDFs can be loaded directly to the Kindle, but they don’t necessarily work properly. They need to be converted to work best. Simply email the pdf files to your Kindle account. If you have a older version of the series you may have to extract the files from the portfolio first. Open the portfolio; click on the book cover and go to File - Extract File.) When the files are extracted to your hard drive they can be mailed to your Kindle account for conversion and download to your device or app. Alternately, you can send the files the files to your Kindle account using Amazons free “Send to Kindle” app. Google Books is a major player in the distribution of eBooks, and you can obtain Google Books in either ePub or PDF formats. Both can be read via apps that work on the computer or iPad. There are millions of out-of-print books available via Google Books for free. For those who are more oriented to older books (such as out-of-print Christian biographies, church histories, and missionary books) and who don’t want to purchase an iPad you read Google books right on your computer. This is also true for the major retailers such such Amazon which offers reading direct from their website with Kindle Cloud Reader. “For my own personal use on my Nook, I have reformatted the book ‘Keeping the Kids’ to an ePub format so that I can more freely adjust the font size and speed of turning pages back and forward and generally have a better reading experience.” Note that this book is now available in pdf, .mobi (Kindle), and ePub formats (as are most of our books.) so conversion is now not necessary. We received a good number of responses from our 2012 survey on eBooks and eReaders. A majority of those who responded said that they use a Kindle, though there were also quite a few iPad users. We had much fewer responses from those who use the Sony or Nook. Many who wrote said that PDFs were somewhat difficult to use in some applications, particularly with the Kindle, which confirmed what we already experienced. We want to make our materials available in the most convenient ways possible, realizing of course that with each method we incorporate we add a new level of time and labor both in producing the materials and in having a completely new set of options in the shopping cart. By the way, we have no plan to eliminate the printed books.